Learn how to develop your identity as a fashion stylist and create diverse forms of imagery for today’s dynamic fashion industry. For 36 years, Lucinda Chambers has been at the forefront of magazine publishing as fashion director of British Elle and British Vogue, where she held the position for 25 years and established long-lasting relationships with some of the world’s leading photographers, including Patrick Demarchelier, Nick Knight and Paolo Roversi. Throughout her career, she has also worked closely with fashion houses such as Marni, Prada, Jil Sander and Chanel, consulting on collections and advertising. Most recently, she styled Pharrell Williams and Imaan Hammam for the December 2017 cover of US Vogue. Stylists are fashion’s gate-keepers, working alongside editors, designers, photographers, models and celebrities, and today the profession is more varied than ever. Take our self-directed course through the foundations of Fashion Styling and Image Making from one of the most renowned stylists in the world, Lucinda Chambers. Through 10 hours of exclusive video content and learning materials, gain an insight into the opportunities and skills required to establish yourself as a stylist. Study whenever you want and at your own pace, and receive your BoF Certificate upon completion. Watch the trailer to find out more. Professionals seeking to enhance their skillset to further their careers. Freelance stylists looking to build their portfolio and influence. Obtain a comprehensive overview of the styling ecosystem. Understand how styling is executed by top-tier creatives, publications and brands. Gain invaluable insight of creative processes across platforms. 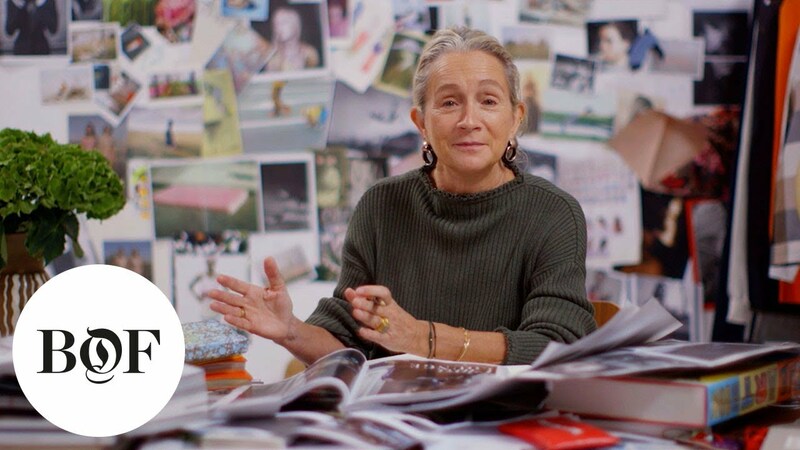 10 hours of exclusive content, including 30 video tutorials from Lucinda Chambers. Downloadable learning materials enable you to revisit key theories and concepts. Lucinda Chambers has been at the forefront of fashion stylist for over 36 years, both as a fashion director at British Vogue and British Elle, and a consultant for Prada, Marni and Chanel. It all started by making earrings at art college, which sold in a London street market. This section introduces you to Lucinda and the lessons she’s learnt along the way. This chapter outlines the role and significance of a fashion stylist in the wider industry, as a cultural gatekeeper, storyteller, talent spotter and curators of ideas. Lucinda Chambers shares her view on the key skills you need to succeed in today’s competitive industry. Lucinda Chambers outlines the variety of roles that a stylist can undertake, with a detailed study of styling for Editorial, Fashion Shows and Celebrities. This section includes insight into the key differences and fundamentals of different types of styling, as well as the teams and timelines required. Lucinda Chambers outlines the variety of roles that a stylist can undertake, with a detailed study of styling for Advertising, Brand Marketing and E-Commerce. In this chapter Lucinda emphasises the importance of collaboration between the stylist and the creative team. It includes interviews with Lucinda Chambers’ key collaborators from across the fashion ecosystem including Shona Heath, Val Garland and Sam McKnight. The chapter outlines in detail the processes behind shoots, and what needs to happen pre shoot and on-set to ensure a successful result. Lucinda outlines how to identify trends and ideas, and reveals her creative processes, explaining concept development from first idea to finished shoot via mood boards, clothes boards and storyboards. Here, Lucinda gives her guide to the rigour required in sourcing and selecting garments, honing the selection until it is the most direct embodiment of the original idea. The section includes a styling demonstration from Lucinda as well as a glimpse into the mythical ‘stylist’s kit’. What does it mean to be a stylist in a digital-first world, where everybody has a voice and the opportunity to deliver across multiple platforms? Lucinda gives her advice on developing a creative identity, the importance of interning and assisting, and how to navigate the freelance market. The chapter includes a Q&A with Alex Carl, freelance fashion stylist and fashion director of RIKA Magazine, and Molly Haylor, fashion assistant to Lucinda Chambers, who has previously been at US Vogue. Key lessons and final words of advice from Lucinda. An appendix of further reading to aid your learning.